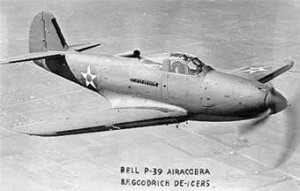 On the evening of January 25, 1942, 2nd Lt. Robert H. Wetherbee left La Guardia Airport in New York in a Bell YP-39 (Ser. No. 40-38) bound for Bridgeport, Connecticut, on a ferry mission. While flying at an altitude over Long Island Sound the engine began to cut out. The fuel pressure would vary from 5 to 8 pounds, and occasionally rise to 12 and 14 pounds. Lt. Wetherbee worked the “wobble pump” in an effort to stabilize the fuel pressure, but found that the pressure would not remain steady. Then the engine began running extremely rough before finally quitting altogether. As the aircraft dropped to 600 feet, Lt. Wetherbee had no choice but to make a forced landing in the Sound just off the coast of Norwalk, Connecticut. The accident investigation committee noted that the same aircraft had been grounded after its previous flight for a similar problem with the engine, and found no fault with Lt. Wetherbee. Lt. Wetherbee received his pilot’s rating on October 31, 1941. He was assigned to the 61st Pursuit Squadron as a Flight Commander.